John Rogers (1829-1920) was the first American artist to give popular appeal to sculpture. Most of the statues depict daily American life. Each on has a title engraved along the base. His studio was in New York City. He was self taught making his models of clay and passed them on to artisans who made them into plaster. There were 80 statue groups made. They originally sold for $25 - $50 each. The bronze statues are housed in the New York Museum of Art. 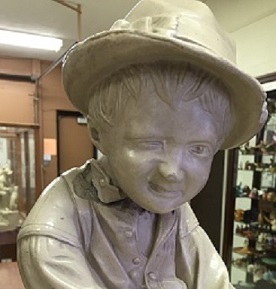 The statues at our museum were donated by Robert Hughes. There are more than 15 in the collection.